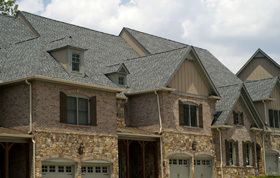 The Pinnacle® premium shingle is at the top of its class. It is a true laminated architectural shingle, featuring distinct shadow lines that provide the added dimension (multi-layered shingle) of a wood shake appearance. Full random cuts ensure that the appearance of undesirable patterns will not occur. Pinnacle® also offers an algae resistant feature to further increase the lasting beauty and elegance of your roof. A wide variety of shingle color options ensure a perfect complement to any color scheme. Pinnacle® promotes beauty, elegance, lasting performance and peace of mind with its transferable Lifetime Limited warranty* that is unmatched in the industry.